Hi guys; it’s Brian Hanington calling. I just wanted to send you a compliment. I received flowers from my company Stiff Sentences today and they are unspeakably beautiful. Perfect, novel and amazing individually, but the way they have been put together is an artwork that I wish I could save for a thousand years. I am going to take pictures, as I hope you have! I have known you for years as the master of your trade but I was floored. In fact, my recovery is sped up in the joy of being refreshed in the beauty that you have created. I will tell everybody about you of course. Hi Joanne … I just wanted to send a little note to say a very special thank you for your absolutely stunning arrangements. As I’m sure you can imagine, my launch party was very important to me.You had an uncanny ability to sense my personal style and the atmosphere I wanted to create for this event … and then you worked your magic! It was areal pleasure meeting you and sitting down to chat about your creations. Everyone was commenting on the gorgeous flowers … and the idea to put something in the powder room was absolute genius. Again … many thanks. Yet another example of why Mill Street Florist is the ONLY option when you want the flowers to be perfect. Dear Joanne, On behalf of the Board and Staff or the Ottawa Public Library I extend my heartfelt thanks for the beautiful arrangement to celebrate the opening of the new Greely branch. Nothing could compliment the library more than vibrant living flowers. They will be a reminder of the great Greely community spirit long past opening day. My daughter chose Mill Street for the flowers for her April 30 wedding. We met with owner Joanne Plummer and were totally impressed by her manner and her knowledge. She spent a long time with us, and we left with confidence that Mill Street would do a beautiful job with the flowers. Others had warned us that Mill Street would be expensive, but we had such a good feeling about Joanne, that she was top of the list right away. 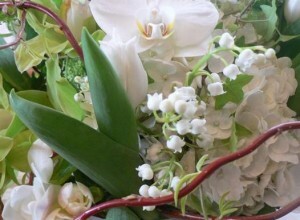 In a subsequent meeting more specifics were worked out with Kate and her fiancé, but Kate had a clear idea of what she wanted, Joanne took great care to acquire just the perfect orchids and lilies and she and her staff made them up with care. 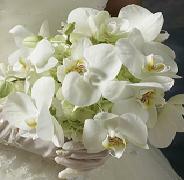 On the wedding day, the flowers were delivered in good time, wrapped well for safety, and they were gorgeous! All except the ring bearer’s daisy survived well (at 18 months, he concentrated on picking off all the petals). The flowers survived the honeymoon and lasted for two and a half weeks. (Even the ones that had been left for two days without water revived and lasted 11 days). And as for price? The flowers came in under budget. We couldn’t have been more pleased. 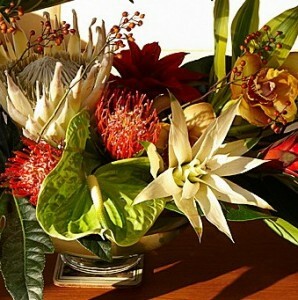 I always choose Mill Street Florist for the tropical flowers ~ they are always stunning! B.C. Who can top your arrangements; let me know, I don’t think it can be done! R.S. We travelled far for what we were told was “the very best” . Thank you for taking good care of a truly special event, our mum’s funeral. T.W. Beautiful shop! We love Manotick! P.L. Stunning displays! Great Atmosphere! L.J.